In the previous articles of the series, we have seen the local Kubernetes solutions for Windows and Linux. In this article, we talk about MacOS and take a look at Docker Desktop and Minikube. Similar to the Windows version, Docker for Mac provides an out of the box solution using a native virtualization system. Docker for Mac is very easy to install, but it also comes with limited configuration options. On the other hand, Minikube has more complete Kubernetes support with multiple add-ons and driver support (e.g. VirtualBox) at the cost of a more complicated configuration. 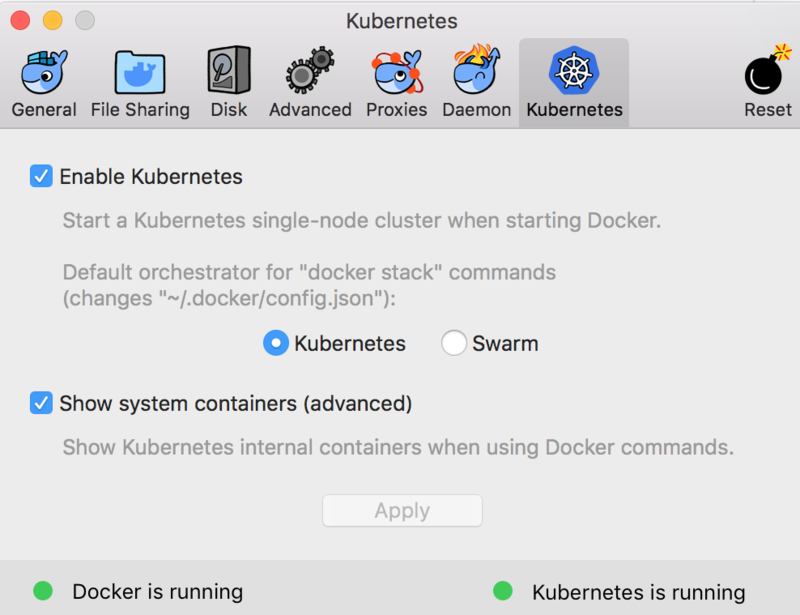 Kubernetes is available in Docker for Mac for 18.06 Stable or higher and includes a Kubernetes server and client, as well as integration with the Docker executable. The Kubernetes server runs locally within your Docker instance and it is similar to the Docker on Windows solution. 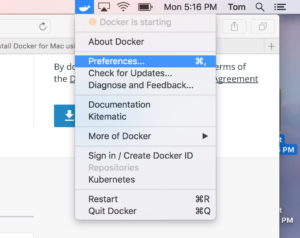 Notice that Docker on Mac uses a native MacOS virtualization system called Hyperkit. When Kubernetes support is enabled, you can deploy new workloads not only on Kubernetes but also on Swarm and as standalone containers, without affecting any of your existing workloads. As mentioned already, Kubernetes is included in the Docker on Mac binary so it installed automatically with it. You can download and install Docker for Mac from the Docker Store. Note: If you already use a previous version of Docker (e.g. docker toolbox ), or an older version of Docker on Mac, we strongly recommend upgrading to the newer version, instead of having multiple docker installations versions active. If for some reason you cannot upgrade, you should be able to use Minikube instead. After a successful installation, you need to explicitly enable Kubernetes support. 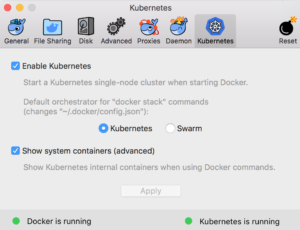 Click the Docker icon in the status bar, go to “Preferences”, and on the “Kubernetes” tab check “Enable Kubernetes” as shown in the figure below. This will start a single node Kubernetes cluster for you and install the kubectl command line utility as well. This might take a while, but the dialog will let you know once the Kubernetes cluster is ready. You can view the dashboard, as mentioned before, to verify that nginx was indeed installed and your cluster is in working mode. This will also include prerequisites such as Xcode command line tools. Additional information, on how to configure and manage the Kubernetes cluster can be found in the official documentation. Deploying an application is the same for all drivers supported in Minikube. For example, you can deploy, expose, and scale a service using the usual kubectl commands, as provided in the Minikube Tutorial. Minikube is a mature solution available for all major operating systems. Its main advantage is that it provides a unified way of working with a local Kubernetes cluster regardless of the operating system. It is perfect for people that are using multiple OS machines and have some basic familiarity with Kubernetes and Docker. Docker Desktoop for Mac is a very user-friendly solution with good integration for the MacOS UI. Let us know in the comments which local Kubernetes solution you are using and why. Thomas Pliakas is a passionate Java software engineer, where he likes to work in performance improvements in each phase of the project life cycle. He has primarily been working on architecting, developing, and tuning low latency and high throughput telco products. He is also a co-organizer of Java Hellenic User Groups (jhug) meetups.